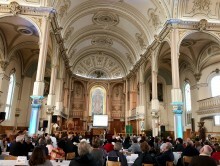 More than 120 citizens of the local communities of the Gaspésie-Îles-de-la-Madeleine participated, Friday in Grande-Rivière, the Forum on the future of religious heritage. Under the theme "The status quo is no longer possible", discussions focused on possible solutions for conserving these heritage properties. Read also the text of Catherine Poisson, with the collaboration of Isabelle Lévesque and Bruno Lelièvre on Radio-Canada.